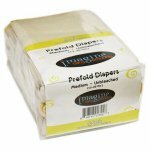 UNBLEACHED prefolds are a beautiful natural color free of any whitening process. We recommend washing and drying them at least 4-5 times on HOT before using to help strip the natural oils and make them absorbent. WHITE prefolds are chlorine-free! They are whitened with a peroxide bleach solution maintaining a low pH level to help avoid any skin allergies. We still recommend washing and drying your prefolds at least 3 times before using. 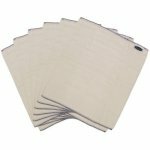 BAMBOO prefolds are stitched with the highest quality thread and the stitching is reinforced to endure durability and longevity. During manufacturing, a special process is performed to prevent pilling. 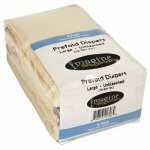 Imagine "Smart Fit" Bamboo Prefolds will last through years of diapering and beyond! Bamboo is soft, absorbent, and naturally anti-microbial. 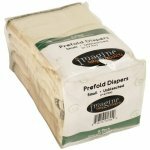 These prefolds feel buttery soft against your baby's skin while offering an incredibly absorbent diapers, holding even the heaviest wetters. The natural bamboo fibers will wash up beautifully and are much less likely to ever get stinky than a synthetic fiber. When you receive your Bamboo Prefolds, they will be flat and slightly stiff. To prep them for use, wash and dry them 4-5 times in a hot or warm wash cycle using detergent and drying them in the dryer each time. After they are prepped they will quilt up and be VERY soft. Imagine "Smart Fit" Bamboo Prefolds will shrink approximately 5-15% during prep. 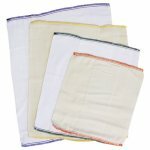 Due to the nature of the bamboo fabric, the prefolds will feel floppier, slightly heavier and will not be quite as quilted as a cotton prefold. 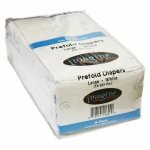 Please note when you receive your prefolds they will be very flat and a little stiff, after you wash and dry them they will quilt and get very soft. The more you wash and dry your prefolds the more absorbent and soft they become! Imagine "Smart Fit" prefolds are made up of three panels of various layers of fabric. The outer panels have 4 layers and the middle layer is a super absorbent 8 layers. Our dimensions are different than the traditional prefolds found on the market - shorter and wider so they fit wonderfully into most diaper covers! 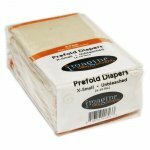 Imagine "Smart Fit" prefolds can be used alone in most diaper covers however we do have Snappi Diaper Fasteners and Diaper Pins available. Prefolds will shrink approx 5-15%. Washed dimensions are approximates. Make sure all of your imagine "Smart Fit" prefold is tucked into the diaper cover to avoid unnecessary leaks!